I made these two cards for a article at StampARTic by the ARTsyteam, and I had so much fun making them. Sat together with a very good friend of mine, and we played with the motives from The Octopode Factory. I love these birds, and I promise you that first thing tomorrow I am going to buy them. Card number 1 is made with lots of water on the background paper, and here I added twinkling H2O with a large waterbrush. It's easy and so fast to make a colorful and shimmering background. 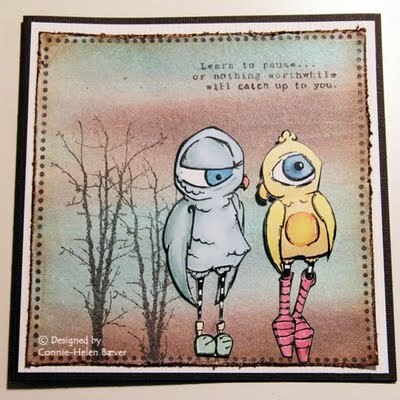 I used my heatgun to dry the background before I added stamps and motives. The tree stamp is designed by me for Kreativ Hobby, and the motives are as I mentioned above from The Octopode Factory designed by Lily. 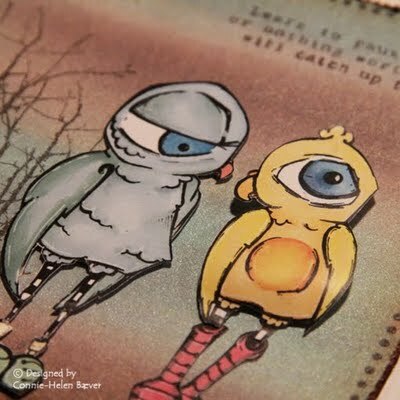 Text stamp is from Tim Holtz. Card number 2 is made with adding water to a nonestick matt, and blending the twinkling H2O with a waterbrush. Then I laid the background paper on top, and did this until I got the wanted result. Chipboard is added on to the background with multi-medium and colored with H2O and rub-ons colors that I bought at HOBBYKUNST. Flowers is also from HOBBYKUNST, and are from the line Mathia. 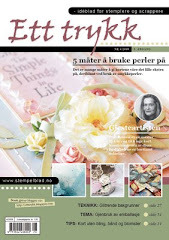 So fun and inspiring creations Connie. Herlige kort som var verd å studeres! 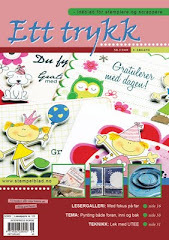 Flotte bakgrunner og herlige motiver. Kjempeflott den siden med lille monster under her også. Så mye monsteret får sagt!!! Uberkule kort og elsker bare de motivene!! Fantastisk flotte bakgrunner!! Klem! Håper alt er bra med deg ! Her var det masse lekkre kort,å titte på.Liker stilen din!! 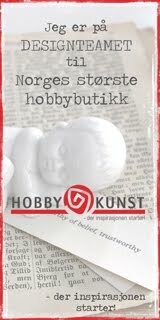 Vi storkoste oss i butikken,når vi handlet av deg inne på hobbykunst.